Remember when I bought those Prada stockings that cost the best part of $100? Well, I’m kicking myself now because according to UK Grazia magazine, a good tip to get the look on the cheap is to buy a pair of John Lewis Jonelle (a British department store children’s school uniform range) grey ribbed tights and cut off the top et voila…….Prada look-a-like knee highs! This tip also comes from an insider at Prada…. 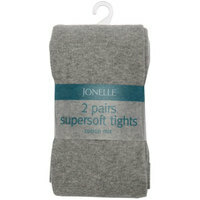 so I’m sure if I go to John Lewis, the Jonelle tights sections will be suspiciously crowded and emptied of stock! Thanks for the advice! Unfortunately, I do not live in Britain where I can purchase those tights, but I’ll keep looking for alternatives. Maybe its wrong of me to still want the Prada socks, out of all the alternatives? Well…I fell for the real thing. I still kinda don’t regret it despite this MUCH cheaper option. By the way Jane: If you read the left column, I might be able to help you get them! i love style bubble! you are my new latest fashion blog addiction! Those are selling like hotcakes on the website! Ho ho…I just nabbed the last pair online (I actually just need grey cotton tights – I get black ones from Jonelle ALL the time – they’re the best!) but you know what, I think they actually have more Prada a-like grey tights instore as opposed to online so I will go investigate tomorrow! If ppl do want me to pick some up email me! Fairy: They’re cheap, £6-£8 for two pairs. And thanks SwanDiamond… that’s very sweet of you to say! primark have the exact same style for £1.